I thought I would try a sketch tonight and I instantly had an idea when I saw last week's Mojo Monday sketch laying on my couch. Didn't realize it was last weeks, thought it was this weeks, but that's OK. I got a card done, and tried a couple new things! I still have tomorrow to do this weeks challenge & get it uploaded! This is a 5" square card. I don't do those often, but it fit this sketch perfectly! Card base is Whisper White, with a 4-3/4 panel of Old Olive layered on. Layered onto that are strips of a stripe print from the Cottage Wall DSP, leaving the Old Olive showing in between. The Cottage Wall DSP combines Rich Razzleberry, Orchid Opulence & Old Olive. 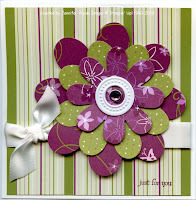 I cut flowers using the new Stampin' Up Flower Folds Bigz Die for the Big Shot using 3 different prints of the Cottage Wall DSP. In the center I added a Jumbo White Grommet & and Rhinestone Brad. The flowers are layered over a White Satin ribbon and a small "just for you" from the set Teeny Tiny Wishes was added in Rich Razzleberry at the very bottom. Thanks for stopping by! Hope your weekend is going well! See you soon! !